Many of us have the Internet in our pocket; an instant connection to news, email and, during an emergency, information that can even save lives. For others, the Internet is a distant concept. And not just in Third World countries - here in Ottawa too. The cost of an Internet connection is more than some people can afford, despite the fact that highspeed connections are literally at their front door. Information is power, as well as a key element of a modern education. Without a decent connection to the worldwide web, people who are already behind the rest of Canadian society are destined to fall further behind. On April 17, 2014, ACORN members from across the Lower Mainland rallied for affordable internet outside Federal Industry Minister James Moore's constituency office in Port Moody. Noel Ouellette, New West ACORN Chapter Co-Chair, led up the action where 15 members from Surrey to Maple Ridge made it out to show their support. For Elmvale resident Robert Fitzpatrick, the Internet is a lifeline. Without online access to services, the U.S. resident says he wouldn't even be able to live in Canada with his Canadian wife. "If it wasn't for the Internet, I wouldn't even be here right now," said Fitzpatrick. 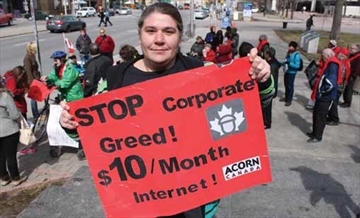 Ottawa ACORN members march 10km for $10/month internet in this CTV Ottawa story on the rising cost of utilities.